I don't know how or why this went down, but in 1973, when William DuBay went from art director to managing editor on Warren's Creepy magazine, he introduced full-color comics to its formerly black and white pages. Creepy had already featured spot color on the inside front and back covers, but this was to be the real four-color deal, trumpeted by house ad copy as "full spectrum" color. Why end the streak of consecutive black and white issues? Maybe it had something to do with the company's big roll-out of Dracula, the "horror art magazine," which would feature color (and that's the extent of my Dracula knowledge). Or DuBay just wanted to freshen up the décor inside Creepy manor, the structure of which had already been under renovation by a group of highly-talented Spanish artists and our old friend Richard Corben. Or maybe he needed to goose sales in the face of competition from Marvel-- the House of Idea released six magazines that year, five of which were horror, a direct challenge to Warren-- and CarToons. Whatever DuBay's reason (and in the interest of full disclosure, I actually don't even care why he did this; I just love these comics for simply existing in the first place), Esteban Maroto provides "Viyi," five pages of story and art in Creepy #51 (March 1973), DuBay's second issue as editor. 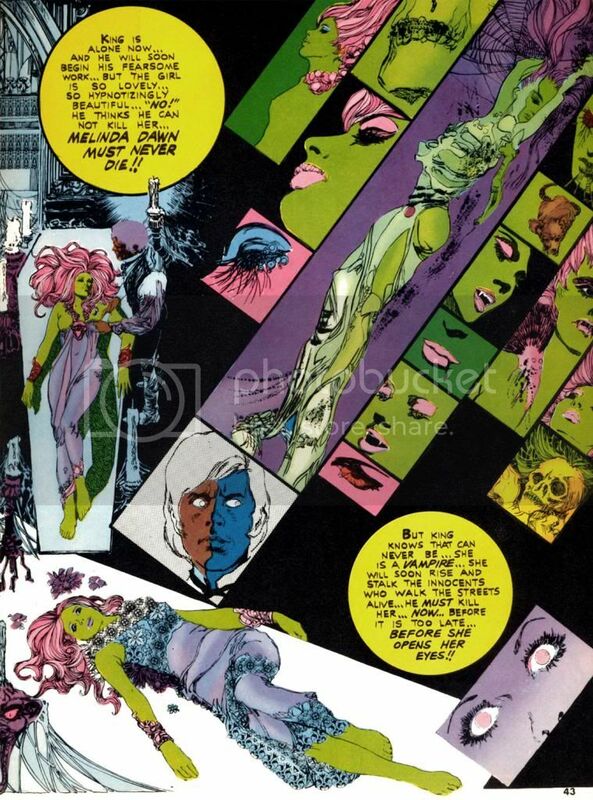 Here, Maroto puts one of his Brigitte Bardot-like females on display, and she's a livid green. Amazingly, it suits her. Maroto also wrote the story, but for Creepy's purposes "Viyi" amounts to a glorified house ad for Dracula. We don't get the complete tale, just a couple of teaser pages telling us all about the new magazine. The colors in "Viyi" are more subjective than representational and suit Maroto's gorgeous, emotionally-charged linework. It certainly looks nothing like the monthly four-color superhero fare showing up on the spinner racks. It hardly resembles the Creepy we'd come to know and love. Perhaps that was the whole point. 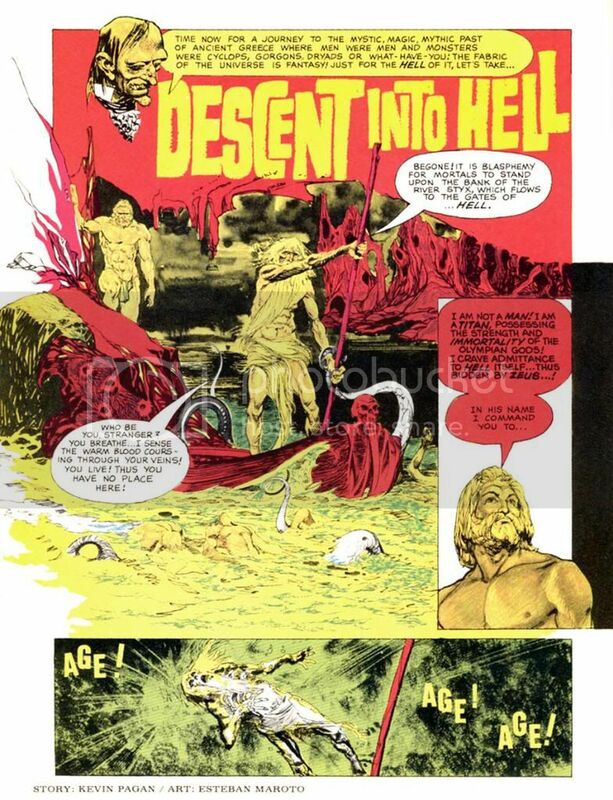 The next color story, "Descent Into Hell," again by Maroto, ran in Creepy #54 (July 1973), which also features Corben's infamous "Slipped Mickey Click-Flip." Only a black and white story as outrageous as that could hope to compete with Maroto's journey straight to hell in lurids red and yellows. And some blues. By then the company must have been jazzed about where this was headed because the cover copy fairly screams, "Now! Full Color Comics!" The next issue consists entirely of black and white reprints but does toss in a neat-o full color board game with movement squares made up of a number of the magazine's classic cover paintings. The credit for it reads, "Game conceived by: Bill DuBay." Corben finally gets his chance to produce some color pages in Creepy #56 (October 1973), where we find his classic "Lycanklutz." A few issues before this a reader wrote in to complain that horror and comedy don't mix, but I beg to differ. Corben's story of a flea-plagued werewolf is not only beautifully drawn, it's absolutely hilarious. It's full of winking references to Universal Studios' Wolf Man movies and some anachronistic humor that anticipates The Princess Bride over a decade later. Corben's palette is more naturalistic than Maroto's. Modeled and painterly as opposed to flat and graphic. Very different looks, but both please me immensely. Corben strikes again in #57 (November 1973), this time partnered with write Doug Moench for a story seemingly inspired by the title of Traffic's 1971 album, which zoomed to #7 on the Billboard pop chart. Do you think Moench owned a copy? Maybe? Whatever the title's source, "The Low Spark of High Heeled Noise" kind of strains to make its pun work, but ends up a grisly, effective murder in an old house tale. Corben's color palette is more idiosyncratic this time out as he experiments with complementary color schemes in the blue/violet-yellow/orange areas of our ever-helpful color wheel. I write "experiment," but I'm pretty sure the guy knew exactly what he was doing. I'm not too conversant on what was happening in color magazines around this time, but compared to the still-primitive color printing in typical monthlies this is incredibly sophisticated stuff from color choice to use of subtle gradations in tone. This wasn't possible in standard news-rack comics in 1973 and it shows Corben's mastery of color reproduction and effects. Color takes a break until the Christmas-themed #59 (January 1974). This time DuBay himself writes for Corben and they come up with a holiday story split between two perspectives that come together for a tragic finale. It's both gruesome and sentimental, no small trick. In this story, Corben employs a restrained, naturalistic palette for a timeless look. Kind of like one of those Coca-Cola Santa paintings. Or Norman Rockwell suffering a psychotic episode. In #60 (February 1974), Corben teams with Steve Skeates for a story that seems somewhat inspired by the artist's own "Den." It's a disquieting tale of a squeamish kid who finds a magic rock, turns into some kind of space-barbarian ape on another planet, then comes to a rather pathetic end. Poor little guy. More relatively restrained colors on display here in the early going, with some sweet autumnal atmospherics on the first page giving way to otherworldly hues during the fantasy sequence. In #61 (April 1974), Corben provides his own script again for another comedy-horror turn. This time, it's "Terror Tomb," with a character named Hardoff Bey and a clumsy mummy tripping the lunkheaded human cast to their doom. Corben's dispensing of these dopes that way provides a nice chuckle amongst the more nihilistic horrors of the surrounding stories. If I have one complaint about the guy's work, it's every so often there's a panel so packed with dialogue the balloon obscures most of a face, squeezing the art into a tiny corner. 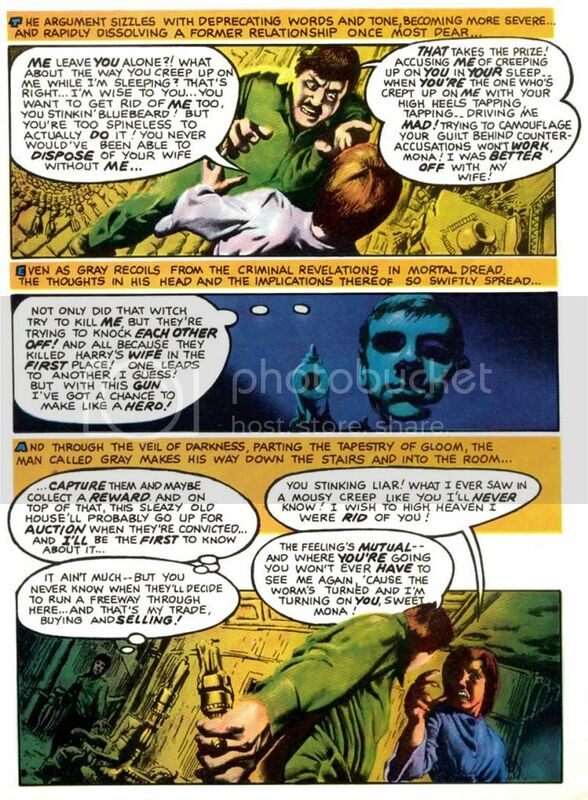 You may be starting to notice a theme here as Richard Corben really makes the most of the opportunities DuBay provides for him, as we'll see in part two of this epic, rambling and altogether pointless overview. My favorite of the whole bunch is coming up!